Emergency medical technicians (or EMTs) and paramedics provide medical treatment and care to sick and injured patients in critical ― and often life-threatening ― situations. Their regular duties include responding to calls for emergency medical services, performing CPR and/or first aid and transporting patients to hospitals, clinics and other healthcare facilities. EMTs and paramedics must become licensed in all 50 states; specific licensure requirements vary by state, but often include a comprehensive exam, a criminal background check and/or certification through the National Registry of Emergency Medical Technicians. Many aspiring EMTs and paramedics begin their career by earning an associate degree in their field. EMT and paramedic associate programs equip students with the knowledge and skills needed for this demanding, high-stress professional field. The curriculum emphasizes hands-on learning, and students will have numerous opportunities to practice life-saving techniques in simulated environments. Associate EMT and paramedic programs often include internships or externships, as well; these courses allow students to receive supervised training from experienced professionals. Many of today's students are choosing to earn their EMT and paramedic associate degree online. Web-based students follow the same rigorous curriculum as their brick-and-mortar counterparts, leading to the same number of postdegree job opportunities. The asynchronous (or self-paced) format of most online associate programs is also ideal for students with part-time jobs, childcare responsibilities and other obligations that may interfere with campus-based learning. Learn more about what you can do with an online EMT and paramedic associate degree program and what kind of career opportunities you can look forward to with this comprehensive guide. WILL AN ONLINE EMT AND PARAMEDIC ASSOCIATE PROGRAM PROVIDE ME WITH THE SKILLS I NEED TO ADVANCE MY CAREER? Online EMT and paramedic associate programs cover all fundamental areas of emergency patient care. Students learn how to assess individuals for cardiac arrest, stroke, respiratory ailments and other health-related issues, and also evaluate different burns, broken bones and other types of traumatic injury. Coursework will also introduce students to essential life-saving techniques, as well as important equipment like stretchers, backboards and ambulance-based devices. Offsite practicum training will give students the chance to apply their skills in a real-world setting. WILL AN ONLINE EMT AND PARAMEDIC ASSOCIATE PROGRAM WORK WITH MY SCHEDULE? Online associate degree programs for EMTs and paramedics offer a flexible alternative to traditional, classroom-based education. Students will be able to access course lectures and readings, participate in virtual discussions with other students, submit written assignments, take exams and communicate with their professors from home on their own schedule. Current technology also allows them to study away from their personal computer using a laptop, tablet, smartphone and other Wi-Fi-compatible devices. For added convenience, online EMT and paramedic associate students can usually coordinate practicum courses at sites located within a reasonable distance of their current residence. WHAT JOBS CAN I GET WITH MY EMT AND PARAMEDIC ASSOCIATE DEGREE? The Bureau of Labor Statistics (BLS) notes that a 'high school diploma or equivalent' is considered the educational minimum for EMTs and paramedics, so those who earn an associate degree will be well-positioned to compete in the job market. Intermediate and advanced EMT and paramedic roles may require additional specialized instruction; the best online EMT and paramedic associate programs prepare students for postdegree licensure requirements, including certification exams and other options available through the NREMT. 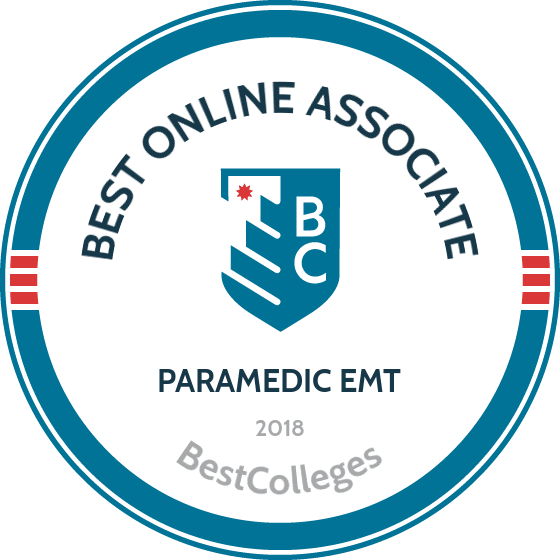 WHAT ARE THE BEST ONLINE EMT AND PARAMEDIC ASSOCIATE PROGRAMS? Choosing a program is an incredibly personal decision, and only you can properly evaluate whether a target school's strengths match your educational needs. The following ranked list of schools should serve as a helpful starting point in your search for the best online EMT and paramedic associate degree programs in the United States. If you are considering an online EMT and paramedic associate program, be sure to contact admissions specialists at different colleges and universities to learn more their about specific associate degree requirements and offerings. UCLA has one of the nation's leading paramedic schools. The reasons why are plentiful: one of the oldest programs in the country, it's also one of the biggest -- and certainly one of the best. And the university's renowned paramedic program is now available in an online, hybrid format. Courses take the form of interactive, online modules, scheduled for Tuesday and Thursday evenings. Participants then travel to UCLA for a long weekends every month to put the theories they've learned into practice with hands-on training. The program opens with an orientation on campus, followed by the "didactic" or online portion. After the 32-week classroom component is completed, clinics begin and run through September, and finally students work in the field for their last eight weeks. More than 90% of the program's graduates are employed as paramedics within six months of graduation. Applicants to the paramedic school online must have a current California EMT certification, at least six months of experience as an EMT, and have completed UCLA's Paramedic Preparation course. UCLA also has a similar hybrid, online EMT training curriculum for those who still need to earn their EMT certification. Located in Hutchinson, Kansas, Hutchinson Community College boasts an enrollment of 6,000 students each year. HCC offers an online associate degree in nursing through an LPN/EMT-P to RN bridge program. Though it is the first accredited online EMT training program in Kansas, students do not have to be Kansas residents to enroll. The degree is open to existing LPNs and paramedics who wish to further their allied health education. The paramedic to RN program begins in January. Future students submit their enrollment applications between March and July of the year before they plan to enroll. The associate degree in nursing requires 69 credits to complete, but HCC grants students 12 credits for prior learning. Coursework includes human anatomy and physiology, human growth and development, and general microbiology. Four courses in the curriculum require a practicum component. Upon graduation from the program, students can take the NCLEX-RN exam for state licensure to practice as an RN. A mid-size Jesuit university located in Omaha, Nebraska, Creighton University has been offering medical education for more than a century -- and emergency medical training for almost half that. The school branched into adult and professional education 30 years ago, and its department of EMS Education now hosts a critical care paramedic certification program that may be completed through the web. Students are required to attend a one-day intensive skills session on Creighton's campus and complete 36 hours in a clinical setting. Designed for currently practicing emergency workers, the paramedic training online program addresses the need for training in patient transport. Critically ill or injured individuals often need a specialized level of care when they're transferred between hospitals. Applicants must have a current paramedic or registered nurse's license, a minimum one year's worth of experience, and health-care provider level basic and advanced life support. Trauma, pediatric, and medical life-support courses are also recommended. Based in Kinston, Lenoir is home to one of the largest paramedic academies in North Carolina, offering an array of options for aspiring first-responders and ambitious working professionals. At the center of the school's paramedic training curriculum is its Paramedic Academy, a 40-week program aimed at entry-level students. Courses are delivered in a hybrid format, combining online classes with real-world practicums in North Carolina. Students spend the first eight weeks earning their EMT certification, which includes four weekend site visits. Current EMTs can skip these sessions and begin paramedic training on week nine. All students then participate in 32-weeks of paramedic studies, which follow the same basic format – online classroom instruction followed by on-site clinical and field work. Other web-based paramedic programs offered by Lenoir include an advanced EMT to paramedic bridge, as well as versions of the paramedic academy and bridge programs that schedule site visits for weekdays rather than weekends. Applicants to any of these programs must meet college-level reading and math requirements and have passed an anatomy and physiology course with a grade of C or better. Lenoir also sponsors EMT training online for advanced EMTs. Located in Thomasville, North Carolina, Davidson County Community College is home to a growing public safety school and fire academy, which has been nationally recognized for its online programming. The school offers a range of training options to first responders -- from the EMT to paramedic levels -- including an online bridge course that allows currently practicing paramedics to earn an associate degree in emergency medicine. The emergency medical science associate in applied science bridge program follows a 26-credit curriculum that can be completed via the web. The program gives currently practicing paramedics (and some high-achieving EMTs) 40 "advance placement" credits toward the 66-credit associate degree. The nine required courses fulfill most of the general education requirements that students in hands-on, first responder training may have missed, including writing and inquiry, general psychology, professional research and reporting, and critical thinking. These are augmented by degree-specific classes like rescue scene management and EMS management. Students must maintain a C average or higher to earn their degree via paramedic training online. EKU is home to one of the first accredited EMS training programs in the nation. The comprehensive, Richmond, Kentucky-based institution offers a wealth of first-responder certificates and degrees, including an online paramedic program that gives students a degree to go with the emergency medical license they already have, opening new career possibilities. The school's associate of science in paramedicine is offered entirely onlnie, allowing working paramedics to remain on the job while they advance their careers. The 64-credit curriculum explores behavioral emergencies, life support, trauma, pharmacology, and more, in addition to 24-credits in general education and supporting studies. Classes are scheduled in eight-week sessions, starting six times per year, and are taught by the same veteran faculty as on-campus seminars. Students can earn 18 transfer credits for previous experience by taking two four-hour courses that prove competency in prehospital theory and trauma. Accreditation is by the standard-setting Commission on Accreditation of Allied Health Education Programs. Many coursework hours count toward national re-certification programs. Iowa Western, in Council Bluffs, Iowa, offers its EMT degree online as part of an associate of applied science in applied business. The program is set to launch in the August of 2018. Students pursuing their paramedic degree at Iowa Western will spend 8-12 hours each week working on distance education coursework and every Thursday in the classroom. During the on-campus sessions, students focus on applying the knowledge gained throughout the week. Courses include foundations of advanced emergency care, paramedic pharmacology/pathophysiology, advanced patient assessment, and treatment in advanced emergency care. The paramedic program constitutes 30 hours of the associate degree and takes three terms to complete. Applicants must be at least 18 years old, hold a CPR license, have completed an anatomy course, and have either a high school diploma or a GED. Current projections indicate strong job growth and steady employment in the years to come for EMTs, paramedics and other assistive healthcare and medical personnel. This trend is largely due to a sharp uptick in the number of medical patients nationwide; millions of previously uninsured Americans now receive medical coverage under the Affordable Care Act (ACA), and the aging baby boomer population ensures a greater need for personnel with geriatric care training. According to U.S. News & World Report, paramedics face an unemployment rate of 3.0%; by comparison, the national unemployment rate for all occupations currently sits at 4.9%. Using data from U.S. News, the following table compares unemployment rates for EMTs/paramedics and other supportive healthcare occupations. The 10-year outlook for EMTs and paramedics is quite favorable, as well. The BLS projects 24% industry growth for EMTs and paramedics between 2014 and 2024, which should result in roughly 58,500 new jobs. According to U.S. News, the median annual salary for EMTs and paramedics is $31,700. However, earning potential for these personnel largely depends on factors like certification level, employer size and city/state of employment. The following table features a median salary breakdown for EMTs and paramedics currently employed in the United States. Salary expectations for EMTs and paramedics will also depend on work experience level. The next table looks at 20-year salary growth projections for five of the most common career pathways for EMT and paramedic associate degree recipients. All five occupations listed on the table experience a career salary growth rate ranging from 33% to 48%. Employees with the Emergency Medical Dispatcher (EMD) certification show the highest rate of salary growth: a 47.1% increase between the entry-level and late-career stages. Employees with basic EMT certification placed second, with 43.4% salary growth after 20 years on the job. Students who complete EMT and paramedic associate programs will be qualified for dozens of entry-level roles, although candidates may need certification or additional training to meet licensure requirements in some states. The EMT and paramedic profession and three related career pathways are detailed below. EMTs and Paramedics: Nearly a quarter million EMTs and paramedics are currently employed in the United States, and nearly half work for 'ambulance services'. Continuing education is essential to this occupation; EMTs and paramedics must be recertified in CPR and first aid every one or two years, and they will receive additional trainings on a regular basis. Basic, Intermediate and Advanced certification can also be obtained through postdegree coursework. Ambulance Drivers and Attendants: Ambulance drivers and attendants operate vehicles and medical equipment used in emergency calls. They often act as supportive personnel for EMTs and paramedics on scene. These personnel are trained to care for sick, injured and convalescent individuals, and must pass a series of background checks and driving tests. Police, Fire and Ambulance Dispatchers: Also known as 'public safety telecommunicators', these professionals act as mediators between emergency callers and EMTs, paramedics, police officers, firefighters and other emergency personnel. They must first assist the callers and gather essential information, then relay this data to the appropriate responding unit. Depending on their specific position, dispatchers may also be trained to handle non-emergency calls. Firefighters: Firefighters are trained to put out fires using a wide range of tools, and rescue people and animals directly threatened by fires. CPR and first aid is an essential skill in this profession, and many firefighters have earned certification as EMTs and/or paramedics. Making professional connections and learning about different approaches to the EMT/paramedic profession is crucial to your success. Professional organizations offer a great entry point for students who want to learn more about their chosen career path. Below you'll find three of the country's most prominent organizations established for professional EMTs and paramedics. These organizations host networking events, provide online trainings, maintain active job boards, and offer other services for career-ready college graduates. National Association of Emergency Medical Technicians: The NAEMT holds partnerships with more than 50 EMS providers and agencies across the country. Members gain access to scholarships, grants, job listings and other exclusive opportunities. International Association of EMTs and Paramedics: Currently representing more than 10,000 members worldwide, this union was created to provide leadership and advocacy for different EMS personnel. Employees in the private, public and 'third service' sectors are all welcome to apply. National Registry of Emergency Medical Technicians: The NREMT offers official certification for EMTs and paramedics; in many states, those who have earned NREMT certification will qualify for licensure. The website hosts a compendium of study guides, practice questions, exam outcomes and other information about EMT certification requirements.